What’s better than a savory pita chip? 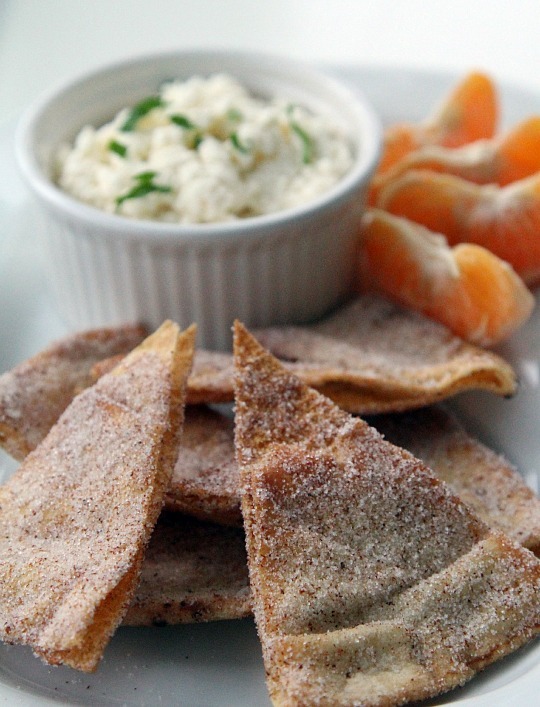 I think it would have to be these dessert pita chips coated in cinnamon and sugar! 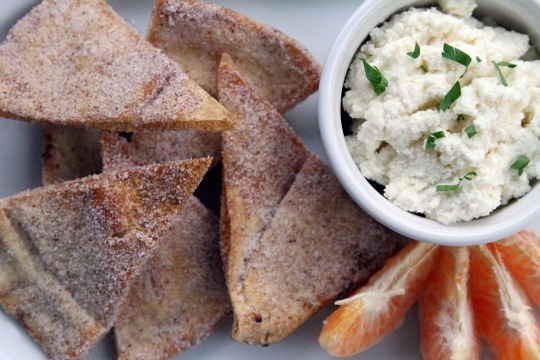 Tired of the regular pita chips I normally make, I decided to explore a sweet pita chip version that could be used at brunch with a creamy, citrus ricotta dip and fresh fruit. The pita chips turned out perfectly, sinfully sweet and super crisp. And given the firm texture, the pita chips work perfectly for thick dips or spreads. Pour oil over the chips and toss the chips with your fingers to evenly coat every piece, front and back. Next, sprinkle with salt. Place into a pre-heated 350F oven and bake for 7 minutes. Then, remove pan and flip each pice, return to oven and bake for an additional 7 minutes. At this point, the pita chips are nearly done so I open the oven door for a few seconds to release its heat and turn off the oven. I close the oven door and let the chips set for another 10 minutes. While the chips are in the oven, put the cinnamon and sugar into a paper lunch bag or small grocery bag. Remove chips from oven and immediately place into the paper bag. Close the top of the bag and gently shake the chips to coat with the sugar mixture. The heat will help the sugar adhere easily and fully coat the entire pita chip. Pour chips onto the baking tray to finish cooling. Store in an airtight container. It’s important to note that you should use a paper bag, not plastic. Plastic has this funny way of melting when touched by a hot pita chip and I learned the hard way. I coated the kitchen floor in sugar on my first attempt. The dessert pita chips can be customized to fit your taste, maybe some nutmeg, cloves, or cardamom in place of a portion of the cinnamon. A little citrus zest might go nicely too (or a drizzle of chocolate?). I look forward to playing with the flavor combinations more. What would be your ideal seasoning for these pita chips? What a nice idea. I’ve only ever made savoury ones before, too. Oohh I love the idea of a sweet chip! Dipping in some chocolate mousse would be divine! I have to thank you…(Nothing to do with this recepie, but I don’t Tweet and you don’t put a e-mail link…). If not for you I would have never able to replace the lids to my dear Pirex glass multi use containers! Thank you so much for that old post with the links . Usefull and intelligent way to do things. Very gratefull. What is the white dip? I tried this fruit dip one time, best ever, and I’ve been looking for it ever since. It looked a lot like that! Can’t wait to try these, I love cinnamon sugar! I’ve been making so many savory pita chips lately, that I didn’t even think about making cinnamon sugar ones! Love these!